Brief overview of modern SSTV (Slow Scan TeleVision) techniques. According to my copy of the ARRL Handbook 1990, Slow Scan Television (SSTV) had its beginning back in 1958 as the result of the effort of a team of Amateur operators led by Copthorne Macdonld, VE1BFL. The aim of their effort was to transmit television pictures over a HF radio circuit. The result was a system that allowed the transmission of a singe television frame of 120 lines within the 3kHz voice frequency range typically associated with HF phone operations. Slow Scan Television (SSTV) was in fact a cumbersome and technically involved process using long persistence cathode ray tubes and related electronics to decode and display a crude black and white trace image. The first time I witnessed a demonstration of Slow Scan Television was back in 1978. The thrust of the demonstration was to show how the transmission of colour images can be achieved by transmitting a series of scans through colour filters and photographically recovering the image through multiple film exposures. It did work and I was suitably impressed, however I concluded that this was for the seriously dedicated SSTV / Photographer. 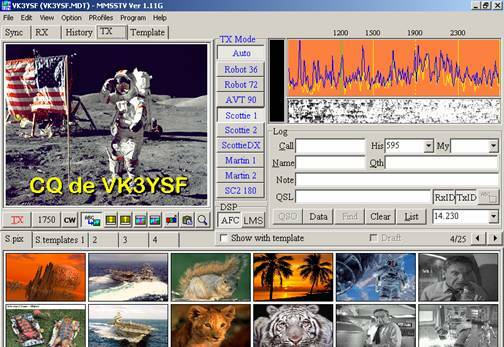 A lot has changed since those days and most SSTV transmission and reception is now generated and decoded by computer software that results in a highly acceptable colour image being exchanged. The SSTV goal is still the same; that is to transmit and or receive a single television frame over a voice channel constant with the band and the mode in use. A typical HF single side band channel would allow approximately 2.5kHz of band width and therefore the SSTV picture will require about a minute build up line by line. There are number of modes of SSTV transmission, but the two enjoying the most favor with operators are Scottie-1 and Martin-1. Scottie-1 is the popular mode in Australia , Japan and the United States while Martin-1 has been more favored by European operators. There are a variety of SSTV software packages available, most of which are very good. My preferred application is MMSSTV, partly as it is free, but mostly as it is a very impressive package with many features and above all is user friendly. MMSSTV will operate quite comfortably on a relatively old computer of the 133MHz Pentium under Windows 95 ilk. A search of the internet will uncover a large amount of SSTV related information and programs. Many hams will passionately advocate MSCAN SSTV V2.2 or another of the host of other programs out there, but MMSSTV is my favorite! See screen dump of MMSSTV with image loaded and ready for transmission. The interface between the radio equipment and the computer is very straight forward. The audio output and input from the radio can be directly plugged into the relevant input and output of the computer's sound card. While many operators have had success with hard connection method I have chosen to use isolation transformers to ensure that stray R.F. can not find its way into un-wanted areas by way of ground loops. Feeding the signal into the microphone socket of the transceiver will require a substantial attenuation of the SSTV generated signal to prevent over driving the transmitter. This can be achieved by feeding the signal via a simple resistor network and fine tuning with the transceiver mic gain while monitoring the RF power level. A search of the internet will find a large range of circuits to achieve the interface between computer sound card and the transceiver. There are also a number of commercial interfaces available for the task. The critical interface issue to watch for when transmitting is over driving the transmitter which will result in a lot of adjacent channel interference and possibly damage to the transmitter. 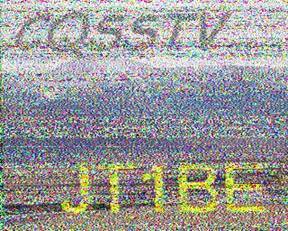 The SSTV generated signal is a frequency modulated tone causing the transmitter to work hard. Therefore it is recommended that the transmit power be wound back to around twenty watts for the average 100W HF SSB transceiver or to about the AM rating of the transceiver. The duty cycle should not be an issue for the typical VHF/UHF FM transceivers. The official Australian WIA band plan designates a number of Slow Scan Television call channels. There are to my knowledge no official designations below the 20metre band although I have monitored SSTV activity on 3.698MHz and 7.040 MHz from time to time. SSTV is particularly susceptible to noise, so my guess is that pictures on the 40 and 80 metre band would be fairly degraded unless the band was particularly quiet or signals were very strong. SSTV can be enjoyed on 2 metres FM were even moderate signal strengths produce a glass hard quality picture. A feature of MMSSTV is it can automatically store up to 32 received images. I have found it interesting to leave MMSSTV and the radio run over night on 14.230MHz and the next morning check to see what parts of the world were open during that period. SSTV has moved from being an expensive technically demanding experimental fringe activity to being a low cost and technically accessible mode for all amateur operators. It interesting to note that this has largely happened in the last ten years and the development of High Definition Slow Scan Television (HDSSTV) and Digital Slow Scan Television which is more to do with file transfer is starting to become more main-stream leaving the future of transmitting pictures over HF radio circuits bright and evolving. I'm far from a dedicated SSTVer I simply dabble, but if you have any questions about SSTV please do not hesitate to give me a call!